While emergencies come in various forms, many of us will face a financial crisis at some point — and it may be hard to keep your head above water when it strikes. 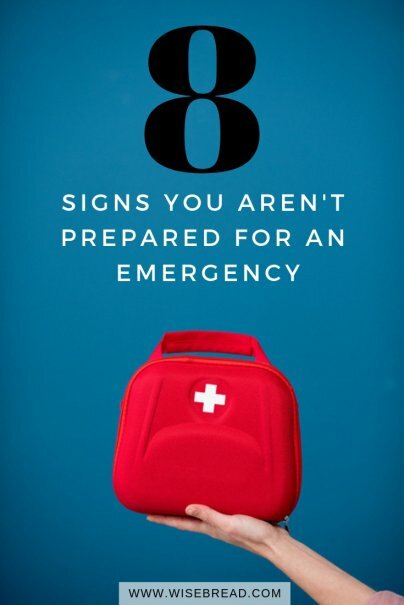 Financial experts constantly preach the importance of an emergency fund. Yet some people don't take steps to ensure they have enough in reserves for unexpected surprises. If you have little to no money reserved for a financial emergency, you likely won't come out of it on top. Say you lose your job and primary source of income. Even if you're eligible for unemployment compensation, what you receive on a monthly basis may be significantly less than your regular salary. Your finances can also take a hit if a medical emergency triggers high monthly payments to a hospital or doctor's office. If you can't afford your health insurance deductible, which can run thousands of dollars, this can result in delaying needed medical treatment. Similarly, lack of a savings account causes problems when you deal with a car repair or a home repair. Some people rely on a credit card when they don't have money in the bank. This puts them in debt and makes it even harder to save over a long period of time. If you've never lived through a natural disaster (count your blessings), you may not worry much about one impacting your life. But anything is possible, and it's important to have emergency supplies on hand just in case. For instance, if you were to lose power after a major storm and couldn't stay at a relative or friend's house, it'll be difficult to prepare food, and the food in your refrigerator would begin to spoil as the temperature inside the fridge rises. Sometimes we don't realize how much we need electricity for meal preparation until we don't have it. Power outages caused by wind and ice storms and other natural disasters can last for hours, or even days. When you don't have power, any appliance that requires electricity becomes useless, including your stove, fridge, deep freezer, and HVAC unit. To prepare for long-term outages, consider a permanent or portable emergency generator. These machines can restore power to your home in a jiff. Permanent generators sit outside the home and run on propane or natural gas, just like your outdoor grill. A portable generator — which is a cheaper alternative (and probably all you need if you're not in a frequent disaster zone) — can operate on gas or diesel fuel. You can store it in the garage, but you should never run the generator inside the home. Using a generator indoors can cause buildup of carbon monoxide, and that can kill you. In the event of an emergency, you'll also need to grab important documents before you head out the door, and unfortunately, if you're unorganized and have your documents stored in different locations, it'll be difficult to quickly locate them in an emergency. Get organized and keep important paperwork clearly labeled in a fireproof locked cabinet, preferably inside a sealed plastic bag; both measures protect the paper from fire and water. Important documents include Social Security cards, passports, your homeowner's or renter's insurance policies, medical insurance cards, and the like. If you have health insurance, auto insurance, homeowner's insurance, and life insurance, you probably think you've covered your bases. But these aren't the only insurances to think about. Life can go horribly wrong in a matter of seconds, so prepare for the "what ifs" with additional insurance and protect your assets. If you haven't already, compare costs for a short-term disability policy which pays a percentage of your salary if you become temporarily disabled and can't work. There are also legal insurance plans that provide affordable legal representation in the event that someone takes legal action against you. Even if you do not live in a flood zone, a flood insurance plan is worth consideration. This is because a standard homeowner's insurance policy does not cover flood damage. Also, most insurance policies have a hurricane deductible, which is higher than the policy's standard deductible for theft, fire, and other perils. If you have a hurricane deductible and your home is damaged by a hurricane, this deductible is a percentage of your home's assessed value, which can be as much as 5%. If a hurricane causes a tree to fall on your house, or if hurricane-force winds break your windows and rain water floods your property, you have to pay the hurricane deductible before your insurance company pays for any damage. On the other hand, if you purchase flood insurance, the policy covers flood and/or rain damage caused by the hurricane. Nowadays, cellphones do more than make and receive phone calls. You can use your phone's Internet to check the weather or news, and some smartphones even have a built-in flashlight. With so much technology in the palm of your hands, it's easy to downplay the importance of an old-fashioned flashlight, batteries, and candles during an emergency. However, no matter what type of phone you have, the battery will eventually die. And if you lose power and don't have a backup generator, you can't power your electronic devices. To make sure you're never stuck in the dark and cut off from the outside world, keep a supply of batteries and candles on hand. When a natural disaster causes widespread power outages, gas stations without backup electricity will not have working pumps, which can trigger a local gas shortage. If you don't have fuel in your car, you can't drive or evacuate the area, if necessary. That, in itself, should be a top priority when you're expecting a major weather event. You must be able to evacuate if needed. Also, lack of gasoline means you can't power a portable generator. Ideally, you should fill up your car before disaster strikes. But of course, impending danger doesn't always come with a heads up. To prepare yourself, consider stockpiling several gallons of gasoline in an approved airtight container. Many containers can hold between five and 25 gallons. Store your gasoline supply in a cool location outside of your home, such as a shed or garage. Regardless of whether you prefer cooking on the grill or stove, a charcoal or gas grill comes in handy during an emergency. If you can't use your stove due to lack of electricity, outdoor grilling lets you enjoy a hot meal until your utility company restores power. Grill veggies, hot dogs, hamburgers, and any other meat you have on ice in a cooler (because otherwise it's probably going to spoil if the power is out for too long). Plan ahead and make sure you have enough charcoal, lighter fluid, or gas to get you through at least a week without power.